And I am not talking about outdoors-related conventions either. No, I am talking about any other type of business-related convention… whatever industry you are in, there are probably tens to hundreds of conferences, conventions, and trade shows surrounding your products and industry. Believe it or not, while not only can you get a lifetime supply of pens at a single conference, you can also get some decent gear! Tip – A lot of conventions/conferences/trade-shows charge for admission, so they can pay for the speakers, location, food, materials, etc., however, a lot give free admission to anyone to the exhibit hall, driving more traffic to their vendors who in most cases have spent between $1000 and $10000 or more to be there. Being someone who has organized conferences and ran booths – for a good vendor, getting items which will be OF USE to the person who takes the swag. That way, their name stays in front of them. With that, you can get some decent gear. In the photo above, I just have a few things that I randomly grabbed for the photo near my gear. I also have things like single-use medical kits, LOTS more carabiners, mini-compasses, more flashlights, synthetic shirts, bandanas, water bottles of all shapes and sizes, S-biners which are dual carabiners with a bottle opener on them, mini-pens (great for backpacking), battery chargers, mirrors, and more. 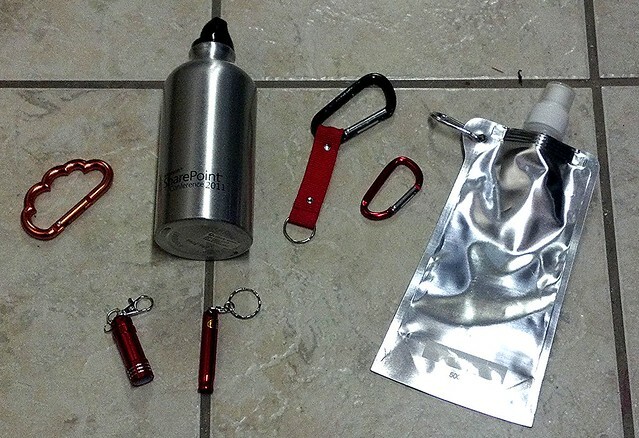 Whether you use this for camping, backpacking, or hiking is up to you. I don’t use all of it, but, I do use some. The rest I keep in my “bug-out bag”, as this can be put to good use if ever there was an emergency. I have even well-equipped my son for day hikes with trade show swag that is useful for hiking. Another good use for this stuff if you can grab it – donate it to your local disaster relief groups, which are usually small non-profits, places that provide temporary help and shelter for the homeless, boy scout troops, and more… just put your thinking cap on. Just don’t take it if you are going to throw it away, put it to use. This entry was posted in Backpacking, Gear, Hiking and tagged Backpacking, camp, camping, carabiner, conference, convention, flashlight, Hike, Hiking, swag, tradeshow, water bottle, whistle. Bookmark the permalink.